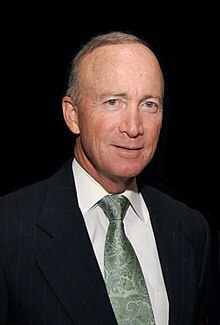 Mitch Daniels (born April 7, 1949) is an American politician. He served as the 49th Governor of Indiana from 2005 to 2013. He was the Director of the Office of Management and Budget from 2001 until 2003. He is a Republican. Daniels was born on April 7, 1949 in Monongahela, Pennsylvania. He studied at Princeton University and at Georgetown University. He is married to Cheri Herman. ↑ "Indiana Governor Mitch Daniels". National Governors Association. Retrieved July 30, 2015. This page was last changed on 14 February 2017, at 23:17.